The Sukhothai labels itself as "a place apart" and they've nailed that tag line right on the spot. While the hotel is new, you can't help but feel like you're stepping into an ancient place, with symmetrical architecture and flowing ponds, aged stones, and flickering candle light. 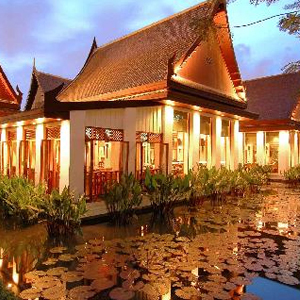 This 5 Star hotel is a favorite among the jet set as well as hi-so locals. The property sits in the business heart of Bangkok. Take a taxi down Rama IV road, and turn into Sathorn. The Sukhothai will be on your left.